Mary is my sister. The little sister I used to drag around with me almost everywhere when I was in high school. I’ll be honest, my mother made me do it. As the oldest of eight kids, I was always being called upon to babysit. Instead of whining about Mary cutting into my social life, I sometimes folded her into it. I was pretty shy back then and there was something very comforting about having her at my side, holding her little hand in mine. I did not take her to any wild parties (not that I went to any), but we did have fun at the beach. 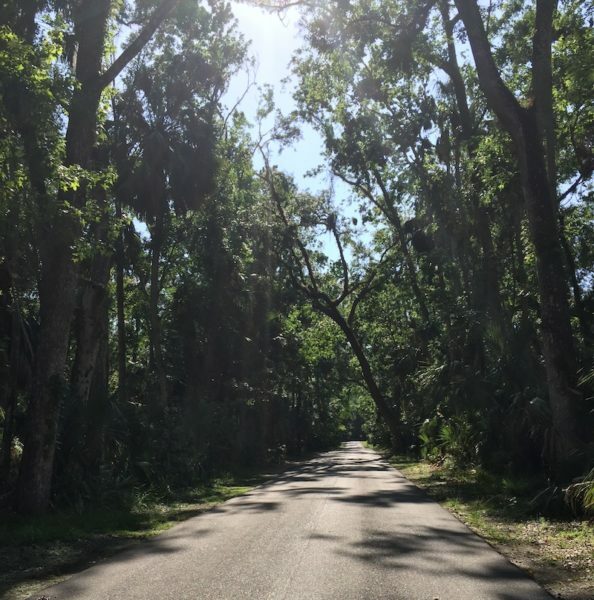 Highlands Hammock is one of Florida’s oldest parks and was developed by members of the Civilian Conservation Corps (CCC) in the 30s. The CCC was a public relief program that was part of FDR’s New Deal. It was designed to provide jobs for young, unmarried men during the depression and operated from 1937 to 1956. If you’re ever in the area, I highly recommend a visit to this 9,000-acre park. 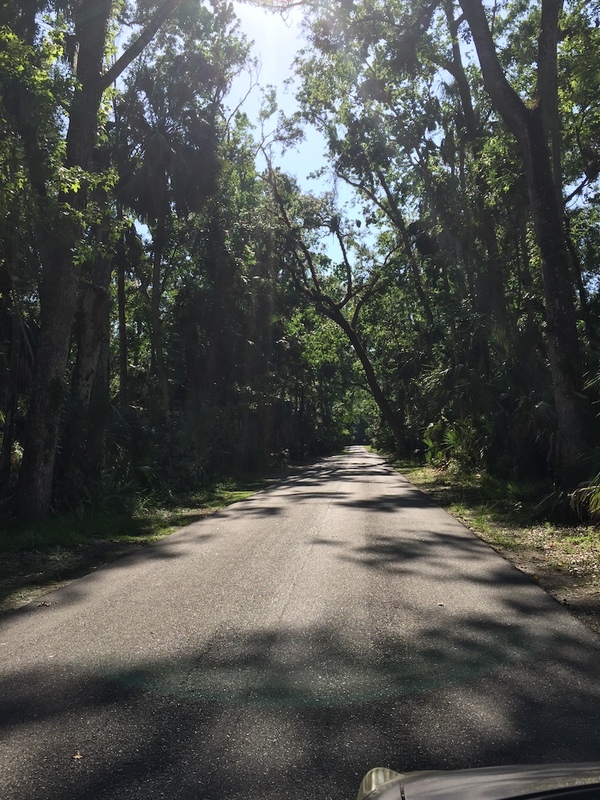 There is a campground, several trails, lots of beautiful trees, and a museum that gives an overview of the park and what the CCC accomplished, not only in Florida but around the country. In the dictionary, the word hammock refers to a “fertile, raised area with hardwood trees in the southern U.S.” It was also used by the English as a nautical term, to describe a tree-covered island. 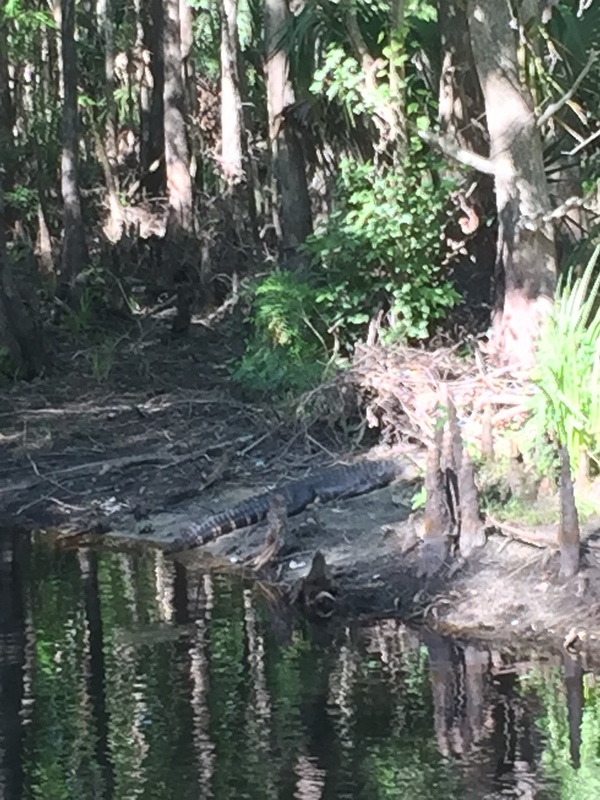 We walked on elevated boardwalks through an ancient cypress swamp. 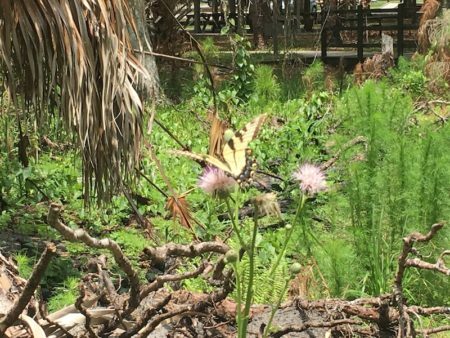 You’re apt to catch a glimpse of several different kinds of wildlife in the park, including whitetail deer, bobcats, tortoises, birds and more birds and … alligators. This is the only wildlife I encountered, but it was spectacular. 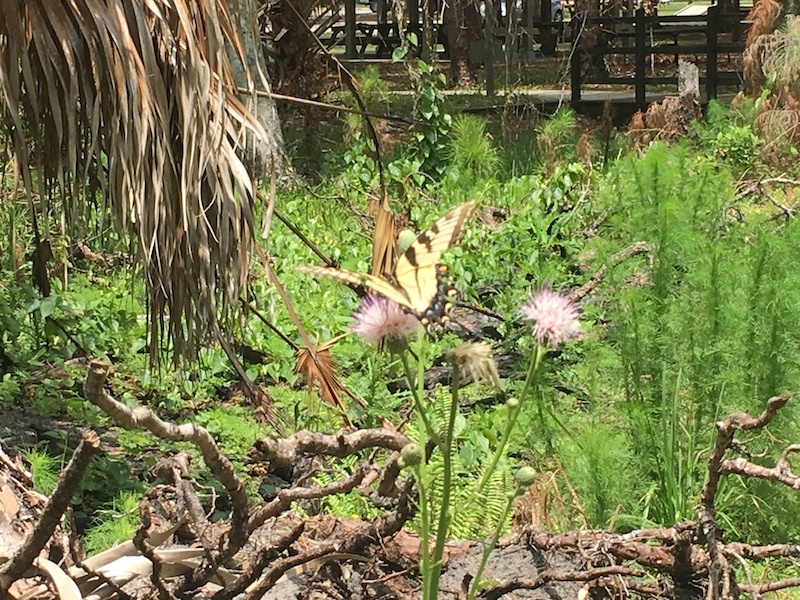 I believe it’s an Eastern Tiger Swallowtail. 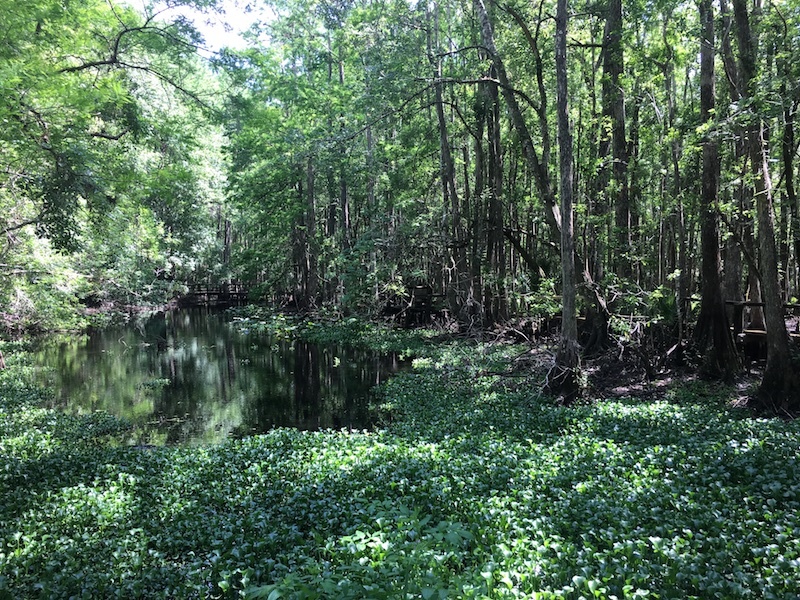 You can read more about Highlands Hammock on the Florida State Park website. 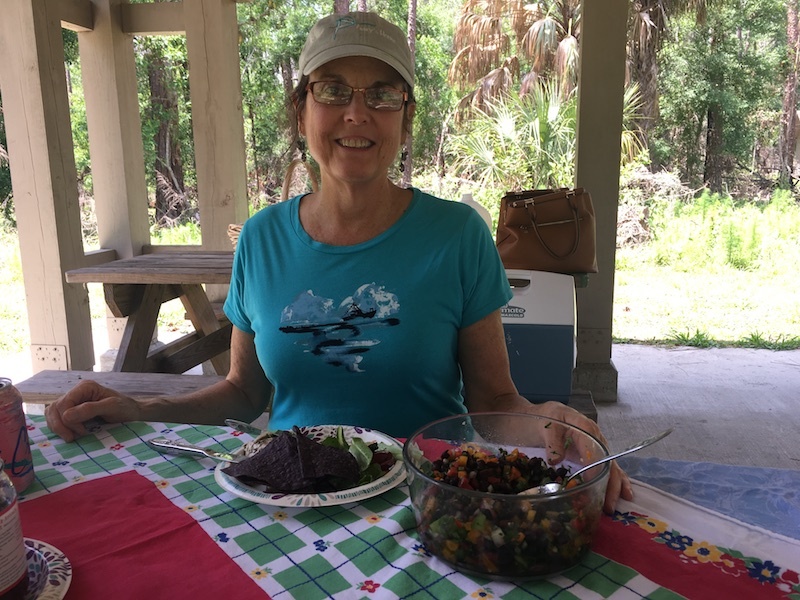 As I mentioned, we had a picnic lunch at the park, lovingly prepared by Mary. She thought of everything, right down to the beautiful tablecloth. I asked her if I could share her bean salad recipe with you and so, here you go. Easy to make for your own picnic this summer. Also colorful, nutritious, and delicious. Dice all the peppers and onion into 1/4-inch pieces. 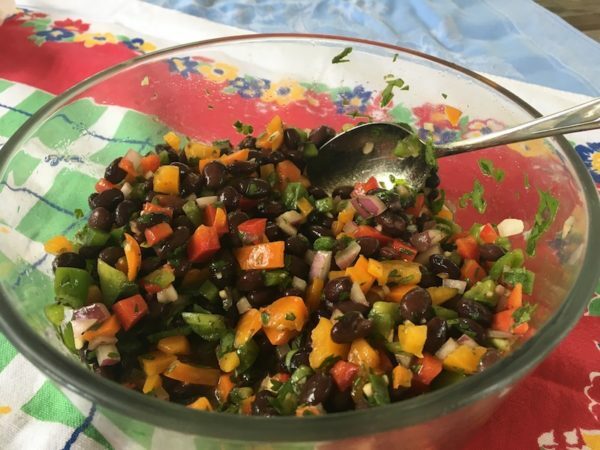 Combine peppers, onion, corn, garlic, and cilantro in a salad bowl and toss to mix. Add olive oil, vinegar, and lime juice. Serve over a leaf of lettuce with tortilla chips.